In the 1958 movie, “Gigi,” Maurice Chevalier sings the memorable song, “Thank Heaven for Little Girls.” I admit, I’m a hopeless romantic, and growing up I always liked that song. But I thought of it strictly in terms of romance. Most recently, I have begun to get a glimpse of how Chevalier must have meant it. I became a grandfather over four years ago. I now have two granddaughters and another on the way. With four sons and a family line that is overwhelmingly strong in producing offspring with the Y chromosome, I didn’t know if I’d ever have any lineage of the female persuasion. To get two granddaughters already, and another soon to take her first gulp of air and join in the sweet, wailing chorus of all newborns, has been a great surprise and an even greater joy. My bride and I recently celebrated our 40th anniversary by visiting our son and daughter-in-law, the parents of two girls. They live quite a distance from us, requiring us to save up for some time to make the trek (our 40th anniversary was actually last year…). We spent about two weeks with them and their little heart-breakers. 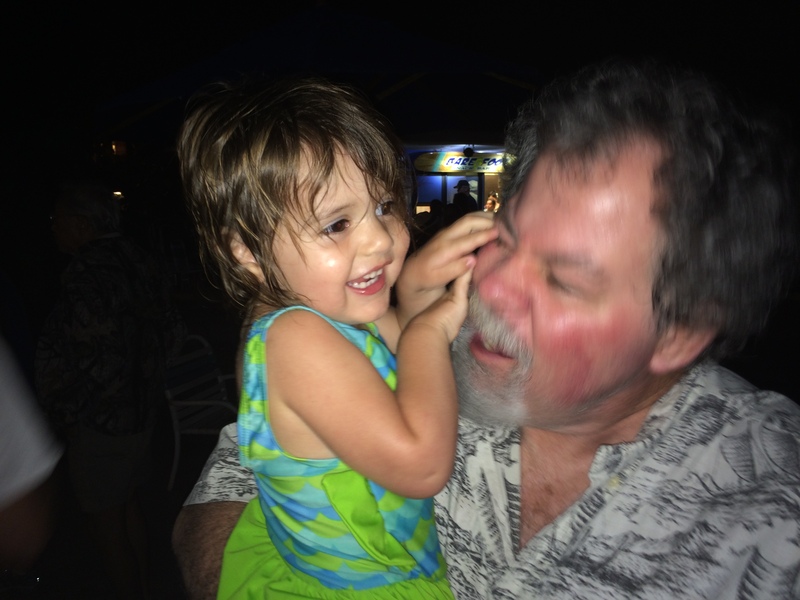 This blog offers some reflections on what I have learned first-hand from logging scores of hours over a sustained period with my granddaughters. For the sake of their privacy, I will use pseudonyms. Claire is four and a half; Mary is two years old. The last time I saw the girls was shortly after Mary breathed her first. She was a helpless little newborn with the biggest eyes I have ever seen. Though of course all the subjective accolades that grandparents and parents lavish on their offspring are entirely true in her case, she nevertheless had not developed much of a personality. She was clingy, smiley, and demanding. Her sister Claire, however, had become a charmer, and she knew it. So, my first surprise on this trip was to see how Mary’s personality was coming sharply into focus. And the contrast between the two girls stunned me. I’m not sure why it did. Pati and I raised four boys, and our twins are almost as different as Jack Sprat and his wife. I suppose I assumed that girls would be, well, girly. I didn’t expect to see Mary have such an adventurous, daredevil, and task-oriented outlook. Claire is chatty. She’s constantly telling stories—some related to life, others created ex nihilo, all engaging, and few understood. Even when her words make no sense, she’s entertaining, with a flair for the hammy. And her Italian side, which she inherited from her mother, comes out in these little performances: she not only cannot talk without her hands, she can hardly talk without her feet! Claire is creative, strongly right-brained, fun-loving, and friendly—as in Will Rogers friendly. She told us one day: “I have Claire teeth today; yesterday I had banana teeth.” What she meant was that her mouth had tasted of banana, since that was its recent guest. But ‘today’ her teeth were back to being her own. Another time she pushed the dining room chairs together to form a train. Then she sat on the front seat and asked me to push. “Is this a game your daddy plays with you?” I inquired, disbelieving a four-year-old’s ingenuity. “No, just my grandpa!” she shot back drolly. She loves to color and cares very little for rules about lines. Rebellious little devil. She has trouble saying the letter ‘l’; when I was teaching her what her last name was, she kept saying ‘Wawrus’! I’m not sure I cared for that implied comparison. And she can be a tad bit narcissistic: I asked her if she knew who my favorite granddaughter was. Her answer, as it is to every question, was ‘yes.’ But then I said, pointing to Claire and Mary simultaneously, “it’s both of you!” “Both of me?” she beamed. Still, she really loves Mary. They play so much better together than our four hoodlums ever did! I taught her some new words like ‘whiskers.’ And every time she pulled on mine, I blurted out a different word. But each pull was as gentle as a feather duster. Claire is a charmer to the core and as feminine as she could be. Then along came Mary. She is deliberate, focused on whatever task she deems important at the moment (and it’s not easy to distract her), and hard headed—literally. We took the girls to a discovery center one day, and they played in the castle. Claire met a couple and decided to fix them a nice, plastic, medieval meal. She brought out various treats and told them not to eat the eggs yet, but to wait for them to hatch. (She didn’t explain why it would be OK to eat a new chick!) She was at her thespian best, never breaking character, for nearly twenty minutes. (Claire often stays in character at length during her impromptu performances.) Meanwhile, Mary systematically put together a wooden structure, then just as systematically took it apart. She next grabbed plastic vegetables growing in a plastic garden and brought them right past her flesh-and-blood grandmother and gave them to me. Repeatedly. Grandma couldn’t get her attention until she had a bargaining chip—plastic vegetables that I clandestinely passed on to her without Mary seeing the transaction. There was intention in Mary’s steps, and her steps were not elegant, graceful, or delicate (of course, she’s only two!). They were the steps of one who would not be deterred in her mission to organize the world. Mary calls me “Haha”—an appropriate name judging by our interactions. She banged her head one day on the choo-choo that Claire had constructed, causing a quick swell on her forehead. I was concerned as the bump immediately protruded, deforming one of the cutest profiles on planet earth (objectively speaking, of course!). She started to cry, but in less than a minute she was off on another adventure, with nary a whimper. She pulled hard on my whiskers as though yanking out the roots would produce sugary delights. And her way of showing affection was to suddenly, without warning, get in my face and promptly do some serious head-butts! During my semi-debilitation from the inevitable headache, Mary would be busy reorganizing a book-shelf. Her mom taught her to say “thank you” and “you’re welcome” shortly before we visited. Mary’s barely-audible super-soprano voice cracked me up when I was trying to teach her when to say “thank you.” All too often the coaxing lesson backfired when she would squeak out, “you’re welcome.” Mary is going to be as tough as nails. She will know what she wants out of life and go after it. She may end up being a sky-diver or an architect, but whatever she does during her adulthood she will be making the world a better, less frightful, and more organized place. A force of nature combined with a force of logic is a lethal combination. Retiring, complacent individuals beware! What truly astounded me were several things about these cheerful cherubs. Every day for them is filled with new adventures, many of their own making. They are constantly learning. The world is still anew and there are so many things they have yet to experience. They trust without question those whom their parents implicitly approve of. They can produce crocodile tears at the drop of a hat, and just as quickly rebound with a boisterous cackle. If they don’t get their way, they can be as obstinate as a hinny. And a traumatic experience can mark them for life. Right brain, left brain. Two little girls, different in so many ways. But both of them orchestrated—so consumately it seemed almost intentional—an indelible impression on this crusty old fellow. They made me young again in ways that not too long ago I would have been embarrassed to admit. Are they perfect? Of course not. They have inherited the dark, rebellious, selfish, and manipulative nature that the train of humanity tracking back to the first Adam has passed on. In each of us there is a beauty and a beast—the imago Dei and the sin nature. But at this age, they have not learned adult ways. Their dark-side skills are still poorly formed, poorly executed. I suppose I didn’t fully expect them to be so, well, human. At times, I was as fascinated with Claire and Mary as I am by a rich theological discussion with one of my mentors in the faith. The increasing depth of their personalities, the complex tapestries of their outlooks, and the ‘serendipitiness’ of their words and deeds, stole my heart. I fully expected to enjoy them, but I had no idea how much. Children are such an incredible blessing from the Lord. And their earliest years are unspeakably significant. 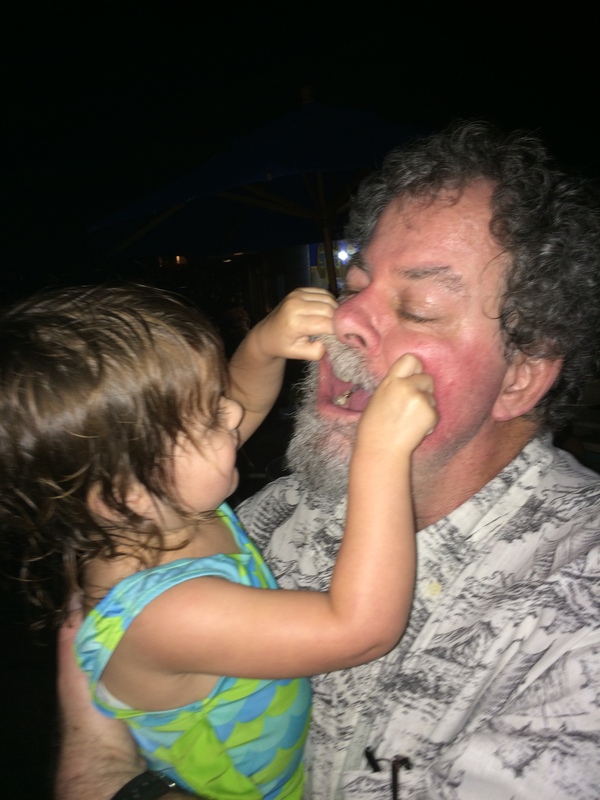 I wish that I knew thirty-five years ago what I know now about raising children. I don’t think mine came out too badly, but, regrettably, I did miss way too many special moments in their lives because I was too busy with ‘higher’ priorities. I suppose one lesson I learned from this holiday, if I may wax philosophic for a moment, was that I’m glad modernism is virtually dead. Those whose lives are measured only by what takes place in their cranial port-side are missing out on so much of life! The emphasis placed on authenticity over mere truth by post-moderns is a necessary, a human, corrective, to a centuries-old, grand experiment that has stripped us of all that we could be. I am not saying that postmodernism is the ideal, much less that it is perfect. Far from it! Of course, these tiny tots know nothing of world-shaping philosophical constructs. They simply are. And what they are is human—as human as the little girl who cried out that the emperor had denuded himself! And it’s that connection with humanity, through my own flesh-and-blood descendants, that reminds me of who and what I really am and gives me hope for the next generation. Grandma and I are already starting to save up for another dose of humanity and our own slice of heaven on earth. John Trent, Kurt Bruner, and Rick Osborne, Teaching Kids about God: An Age by Age Plan for Parents of Children from Birth to Age Twelve. John Trent and Gary Smalley, The Blessing: Giving the Gift of Unconditional Love and Acceptance. John Trent, Eric Tooker, and Rodney Cox, Parenting from Your Strengths: Understanding Strengths and Valuing Differences in Your Home. LeapFrog: Letter Factory (DVD), and other DVDs from ‘Leap Frog’. Melissa & Doug USA Map 51 pcs Floor Puzzle. Any Dr. Seuss books (which are excellent for teaching children to read and see the world creatively). The Growth and Giggles website, with many resources on parenting young children. Bravo, and brava to the little ones who are such good teachers! God’s blessings upon you and yours Dr. Wallace! A Hebraic scholar in the making? I really enjoyed this! Thanks! Who would have thought? !